This explanation is not meant to be all-inclusive, or weigh you down in description. It is meant to give you only the most basic idea of what this disease is, in the simplest of terms. The term “Myasthenia Gravis” comes from the Greek and Latin words for “grave muscle weakness”. Most of us with Myasthenia Gravis, refer to it as MG.
first I tell them that it is similar to MS (Multiple Sclerosis). They are different, but similar. MG is an autoimmune disease. “Autoimmune” means that the body is attacking itself. The most basic way to explain this, is to say that MG causes our bodies to make antibodies that work against our own nerves and muscles. Men, women and children can get MG. It is most common in women. MG causes severe muscle weakness. Some individuals with MG have MG that only impacts their eye muscles. This is called Ocular MG. Most with ocular MG go on to develop generalized (body-wide) MG. This can impact virtually any muscle in the body. It is common to have problems with vision, speech, chewing, swallowing, movement of the arms and legs, and breathing. 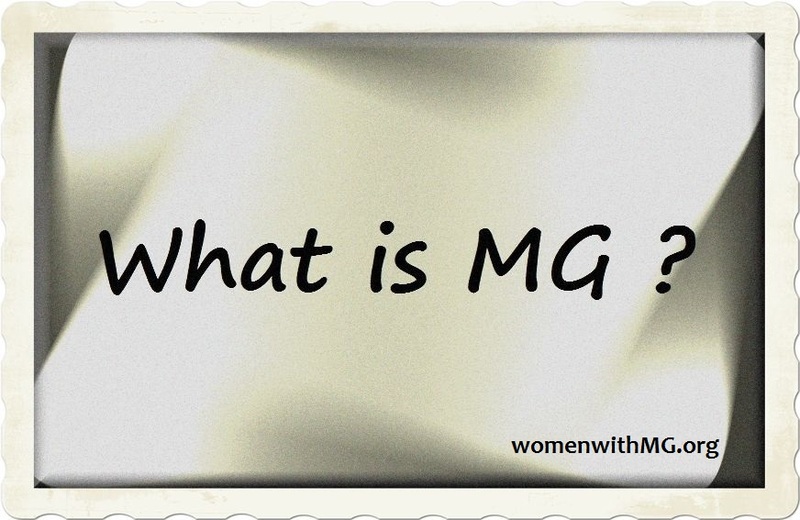 Many of us with MG are misdiagnosed for weeks, months or even many years. Often times it takes our disease progressing quite a bit and becoming quite severe, for doctors to even think to consider testing for Myasthenia Gravis. This is one of many reasons that we need increased awareness. This is one of the hardest things for unaffected people to understand. One minute a person with MG might be walking around appearing fine. The next, they might need a wheelchair, or be too weak to talk or breathe. People experiencing MG crisis or flares, are often mistaken for being on drugs, due to difficulty walking, visual issues, and slurred speech. There are many reasons that symptoms fluctuate. Many common medications are dangerous for those with MG.
Heat and cold are dangerous to those with MG, particularly heat. Emotional and physical stress cause a dramatic and rapid increase in the amount of bad antibodies in the bloodstream. The more a person with MG moves a muscle – the more the body sends bad antibodies to that location. This can cause the muscles of a specific area to become temporarily paralyzed. The levels can increase so much throughout the bloodstream, that breathing can become labored or even impossible. Exercise can be particularly dangerous for people with MG.
Getting sick, with even a minor cold, can be very dangerous for someone with MG. There are treatments for MG, that have varying results in terms of effectiveness. All treatments currently available, come with serious, and sometimes life-threatening, side effects. Sometimes MG will go into periods of remission (symptom free) that can sometimes last for years. At this time, science cannot explain why. But we do know that triggering events (illness, stress, etc.) can bring people out of remission and back into full-blown disease again. All of us hope for remission, few of us experience it. It is very important that individuals with MG listen to their bodies, not exert themselves too much, and eliminate as much stress as humanly possible. It is extremely important that people with MG get plenty of rest. Not just at night, but throughout the day, and anytime they feel their symptoms flaring. Resting and not moving any muscles (other than those required for breathing), helps to lower the levels of bad antibodies in the bloodstream (as their production is increased by movement). The prognosis/lifespan for those with MG has improved. Due in large part to the ability to now rescue people by putting them on a ventilator when they get too weak to breathe, giving the body a period of rest. But it is absolutely crucial that the person get that help quickly – which is another reason awareness is important. Imagine a person walking down the street and suddenly they stumble, slur their speech as they try to ask for help, and then fall. If you walk away and do nothing, assuming they are intoxicated – they may die. But if you are aware that things like this happen to people with MG, and don’t make incorrect assumptions, you can possibly get the person life-saving medical attention in time. Treatments and rescue do not always work. Myasthenia Gravis is still a deadly disease. Some who pass from MG, die from MG itself, and some die from the effects of the treatments used to attempt to control the disease. We don’t want pity, we do appreciate understanding. Many of us have lost friends because we cannot do the things we could in the past. Consider donating blood and/or plasma. Many of us survive on the donations of others. Do NOT go out in public sick. Many who have immune issues, lose their life because of common illnesses, that send their body into flares. You can help prevent this by not going anywhere you don’t absolutely have to, when you are sick. If you are sick and you don’t have to be somewhere – PLEASE STAY HOME. You could be saving someone’s life that you don’t even know. that funds MG research and/or awareness. Please check the reputability of any organization (for any disease) before donating. Research is important. Awareness is also important. Awareness can save lives. People need to know that not every person slurring their words is drunk or high. People need to know that just because a person uses a wheelchair one day, and not another – does NOT mean they are “faking it”. Doctors need to know the symptoms so that they will stop misdiagnosing so many of us, often for years. This often leads to crisis when someone with MG is given medication that is contraindicated with the disease. People with MG can die from being given the wrong antibiotic, anesthesia, or something as simple as too much magnesium. Awareness saves lives. Use the buttons below to share this post. Help us raise awareness. Help us save lives.